Why 12 On – 12 Off – 12 Month Replacement Schedule? Double Ended HPS technology has been a great success for indoor commercial growers. This is due to its higher intensity and more focused light in certain fixtures. One similarity DE grow lamps has to Single Ended lamps is the spectrum can degrade even though the light still looks the same to you. Because of the nature of the physics involved in High Intensity Discharge (HID) grow lights, they can only stay at optimum performance ratings for so long. This is why growers who use DE should also make sure they are replacing lamps once a year. When Should You Change Double Ended Grow Lights? Just remember: “12-12-12.” Most growers are using a flowering lighting cycle of 12 hours on and 12 hours off. Lamps should then be replaced every 12 months. Growers must remember quality plant growth is dependent on intensity as well as spectrum. Humans don’t see light the way plants see light. As a lamp gets older, both spectral quality and total overall photons drop. This can have a dramatic effect on your bottom line. Many growers focus only on micro moles (µmol) of intensity when evaluating their DE performance. It is important to understand DE µmols may not decrease more than 5% over 12 months, but the spectral quality will degrade more than 10% over that same time period. This will result in a loss in overall yield. 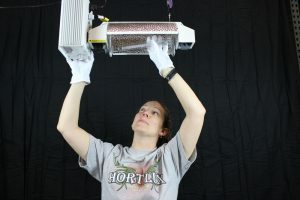 Lumen output and PAR numbers, which can be misleading when growing indoor, are even less reliable when a lamp has been running for several months. Some of those readings might show no significant drop over that time. Intensity readings don’t tell you what you are losing in spectral quality because those instruments do not measure spectral quality. Make growing easier by having a consistent lamp replacement schedule. Keep a log of when you installed your lamps, then mark your calendars to remind you when to replace your lamps. By the time you see lower yields it’s already past time to replace your lamps. Staying on a good replacement schedule will help you avoid that loss before it happens.